Dry ice is great fun all year, of course, but there’s just something about October and Halloween that really brings out the coolest dry ice experiments. For this dry ice experiment, all you need are a big bowl, a small chunk of dry ice about the size of three or four ice cubes, some water, a smaller bowl, some Dawn dishwashing liquid, and a narrow strip of cloth, about a foot long. Easy stuff to gather! 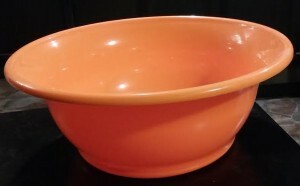 Start with the big bowl with a smooth round lip. Start with a big mixing bowl. With protective lab glasses on your face and thick protective gloves on your hands, pick up the chunk of dry ice and put it in the bowl. Fill the bowl about half full of plain water. Do not put your hand in the water. The contents of your bowl will begin to bubble and create fog-like smoke. In the smaller bowl, squirt about a half inch of Dawn dishwashing liquid in there, and put the strip of cloth in the Dawn. Saturate the cloth in Dawn. Lift the cloth out of the Dawn and strip the Dawn off just enough so it’s not drippy. Put the strip of cloth over the bowl and begin to draw it back and forth, back and forth. 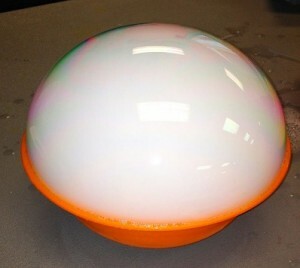 After just a minute or so, a huge bubble will form on top of the bowl. What have you done? You’ve trapped carbon dioxide under the bubble! Isn’t this the coolest thing you’ve ever seen? It’s like a fortune-telling crystal ball! The bubble will cover the entire top of your big bowl. It will be smooth and snow-white and beautiful. It will last several minutes and then it will overflow the bowl and pop by itself, leaving puffs of snow-white dry ice smoke. You can also pop it yourself for the same effect, and then start over again with your Dawn-drenched strip of cloth. You can do this over and over until the dry ice melts and the water stops bubbling. 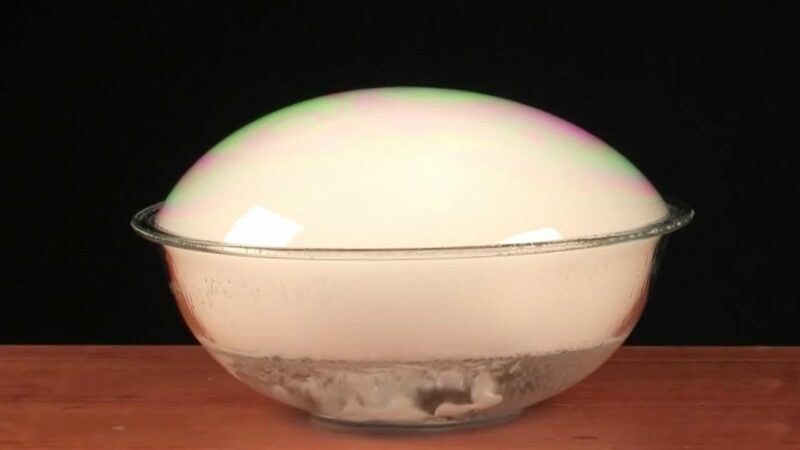 https://www.stevespanglerscience.com/wp-content/uploads/2015/10/dry-ice-crystal-ball.jpg 720 1280 https://www.stevespanglerscience.com/wp-content/uploads/2017/07/steve-spangler-science-logo-435.png 2015-10-13 00:05:142017-07-18 08:54:26Dry Ice Crystal Ball! It’s the smoke that makes the bubble look white. The white smoke is actually tiny water droplets, much like a cloud in the sky. Or, essentially, fog. They appear for the same reason we see fog some cool nights/mornings; the always present water vapor cools quickly and condenses into tiny droplets. The droplets are small enough to float around with the breeze, but big enough that we can see them.